We import Brazilian decking from responsibly managed forests. Each decking option is harvested sustainably for minimal environmental impact. By creating a market for wood, we place high value on thriving forests, protecting them from clear-cutting, soy farmers, and cattle ranchers. Your order of decking contains no environmentally harmful chemicals, or preservatives. Your deck will be 100% biodegradable. We are proud to offer FSC® certified lumber, essential for any LEED certified building project. Rest assured, Brazilian decking is the eco-friendly choice. Durable. Beautiful. Natural. Why would anyone settle for less? 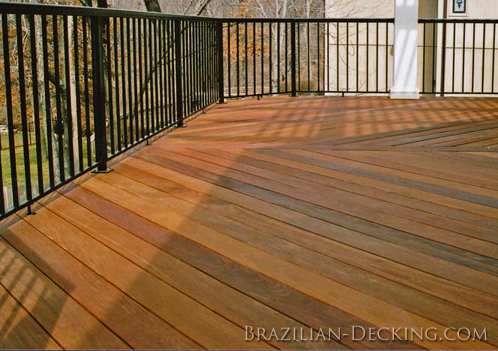 Brazilian decking species include Ipe, Cumaru, Tigerwood, & Garapa. Each option represents the pinnacle of quality, setting a standard that even the finest man-made substitutes fail to live up to. Brazilian decking is the longest-lasting deck material you will find. Without exception, every species of exotic lumber we sell is sturdy, dense and capable of resisting the elements. Each species offers a virtually maintenance-free backyard escape. Having a durable and reliable deck also positively affects your wallet. How? Fewer maintenance costs makes exotic decking one of the cheaper, most rewarding decking options in the long run. With a Brazilian deck, you spend less time worrying and more time relaxing. Brazilian decking brings a stimulating palette of visual appeal. Chemically treated hardwoods like pressure treated pine are familiar, maybe even dull. Man-made substitutes look like what they are - fake. In a sea of boring aesthetics,No matter which species of exotic decking you choose, everyone will want to stop and look at the gorgeous colors and patterns that grace your deck surface. Brazilian decking is 100%, all natural exotic hardwood. This means that your deck is free from harmful, toxic chemicals that could harm the environment and your family. Each species we offer does not require chemical treatment to resist insects, or decay. They do so naturally. By owning completely organic deck, you will also have a positive impact on the environment. Now that you know why Brazilian decking is the smart choice, why settle for less? You deserve the best, and that includes organic decking materials. Look through our website, and decide which species of exotic decking is right for you. Build your perfect deck with Brazilian Decking.